Thousands of people throughout Long Island and New York City rely on mass transportation to commute to work and travel throughout the region. While buses and trains provide an economically and environmentally friendly way for people to get to their desired destinations, serious personal injuries may occur in the event of a bus or train accident. Buses may collide with other motor vehicles on the road. Unfortunately, buses and trains occasionally operate so recklessly that their passengers may be injured from severe and unexpected starts or stops. Bus drivers may drop off their passengers on parts of the roadway that are not safe, resulting in a trip and fall accident or being struck by another motor vehicle. 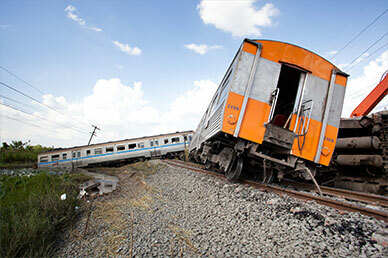 You may have a personal injury claim if you were injured because the operator was negligent in operating the bus or train, collided with another vehicle, or made an unusual, unexpected, and unjustified start or stop. You may also have a claim if the transportation authority failed to properly maintain its vehicle or failed to properly train and or supervise the vehicle operator. There are intricate rules for filing no-fault insurance medical claims that stem from bus accidents. There are also many pitfalls when bringing a claim against the municipality that owns and operates the bus or train involved in the accident. There are very specific Notice of Claim requirements that must be followed before you can succeed in bringing your personal injury or accident claim. The Noll Law Firm, P.C. will guide you through the process. If you have suffered an injury in a bus or train accident, whether it was on a city bus or a private bus, you should speak to an experienced personal injury trial attorney right away. You have rights that entitle you to compensation if you can prove the accident occurred as a result of the operator’s negligent or reckless actions. However, there can be multiple parties at fault, so it is important to consult with an experienced accident and personal injury attorney as soon as possible. If you miss the filing deadlines required in an injury claim against a municipality, you will be forever prevented from obtaining just compensation for your personal injuries. At The Noll Law Firm, P.C., we are committed to helping bus and train accident victims throughout Long Island and New York City recover the compensation they justly deserve. Our experienced attorneys have the persistence and commitment to see that you recover the damages you are owed. The Noll Law Firm, P.C. prides itself on the personalized attention our clients deserve. We will act swiftly on your behalf and take the necessary actions to help you recover financially while you recover physically. If you are looking for dedication and integrity, The Noll Law Firm, P.C. is the firm for you. I was injured by a New York City bus, what should I do? What happens when I get injured on a sidewalk? I have sustained a spinal cord injury. What can I do? How do I get no fault benefits? What are some dangers seen on construction sites? Can social media affect my lawsuit? What safety precautions are necessary on a worksite?